Brand: Wilton 1904-100 Units: 3/pkg. 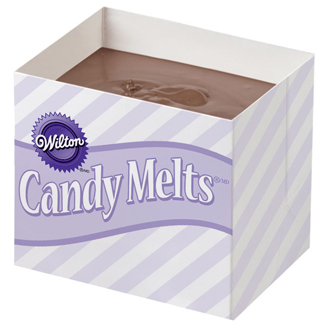 Easily melt candy coating in these disposable containers. No clean-up needed! Each container holds about 14 oz. of unmelted chocolate candy coating. To Use: fill container with candy coating wafers, place in microwave to melt, dip treats, throw container away. Easily melt candy coating in these disposable containers. No clean-up needed! Each container holds about 14 oz. of unmelted chocolate candy coating. To Use: fill container with candy coating wafers, place in microwave to melt, dip treats, throw container away.